Integrating a job portal in your existing WordPress site or making a new jobs/freelancing website can add a lot of revenue for you. Once you have done the initial work, a job portal can continue making money for you on the auto-pilot. You might be already familiar with job sites, am I, right? You might also have visited some job sites for one purpose or another. These websites allow companies or individual employers to post job vacancies and allow the job seekers to apply for their desired jobs. As more people are getting things done online, the popularity of the job sites is also increasing rapidly. If you have ever thought about creating a job site of your own, you have come to the right place. In today’s post, I will introduce you to the ten best WordPress themes and plugins that will help you to create a job site. I will discuss the WordPress Job board themes first and focus on the plugins later. What’s your Choice for creating WordPress Job Website? If you are building a job site from scratch, I would recommend buying hosting from a reliable hosting company like Bluehost or SiteGround. These companies will handle the load of your growing job portal. 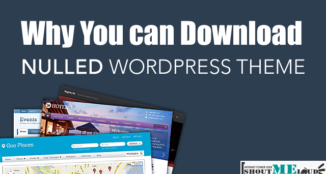 You can download WordPress guide by ShoutMeLoud to learn everything about WordPress. Once you are there, now here are best options to build your site. My suggestion is to take a notepad/pen and note down the basic requirement for your job portal. 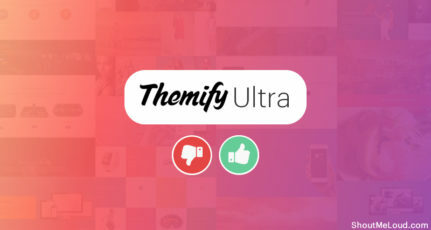 Also, go through the features offered by below themes & plugins, and add those features which you find useful. Now, based on your final requirement, see which of these options meet your requirement & grab it. It will hardly take about an hour & your job site will be up & running. WPJobus is a powerful WordPress theme for creating job boards, personal resumes or company profile sites. The theme allows you to manage three types of entities – resumes, jobs, and companies. All the entities will have advanced profiles, and they will be included in their respective directories. When using the theme, you won’t have to use separate plugins for managing your job site. WPJobus is provided with all the necessary options. There are more than 60 field types in the resume. As the theme is provided with complete Stripe support, you can earn money by featuring resumes, jobs or companies. 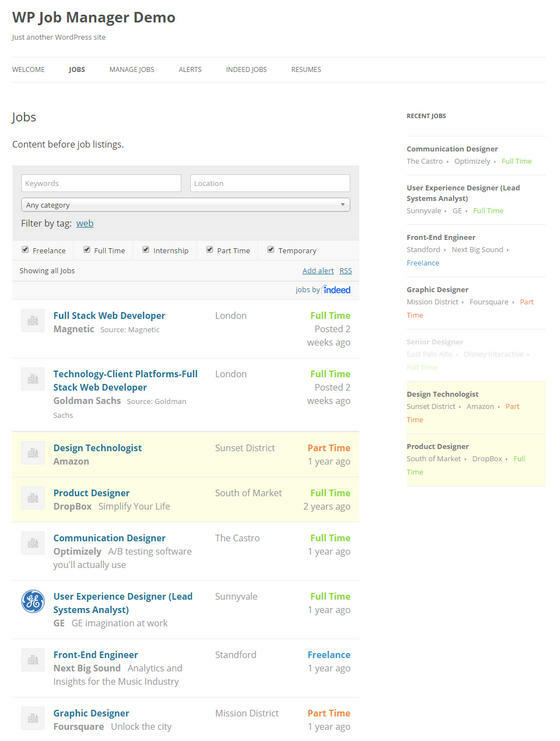 The AJAX powered search feature would let the visitors search for their desired jobs or companies. They will also be able to fill their resume, create an account and add company profile by using the front-end data input system. You can get the theme for $59. 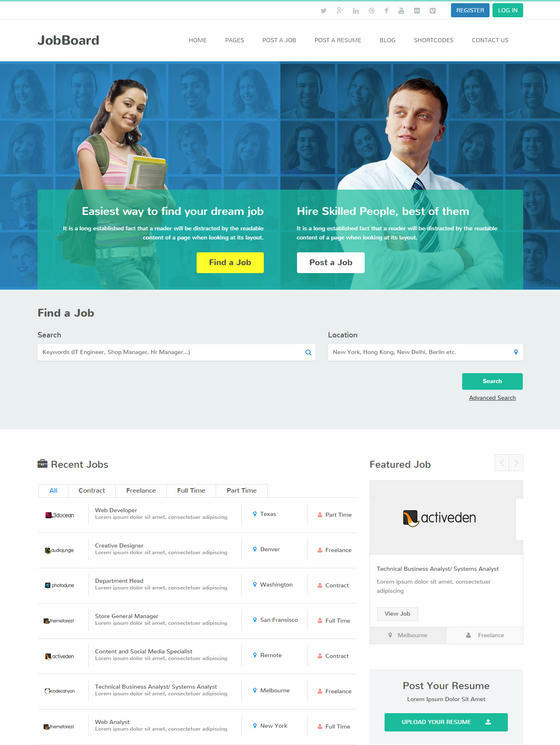 Jobify is a professionally designed WordPress theme for creating excellent looking job sites. With the help of this theme, you can easily create a simple and user-friendly community job site for employers and potential employees. The fully customizable home page of Jobify lets you create unique front pages for your job site. Visitors can search for their desired jobs, companies or employers. The search results could be updated by using various filters. The site admin can approve, monitor and apply charges for posting job ads. 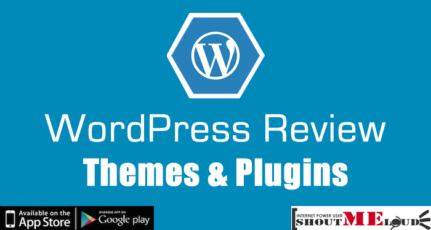 The theme works perfectly with all the relevant plugins including WP Job Manager, Resume Manager, WooCommerce Paid Listings, Testimonials by WooThemes, NInjaForms, GravityForms and Slider Revolution. You will also find the page templates and custom shortcodes very useful. You can purchase the theme for $69. Jobmonster is a hard-coded WordPress theme for creating fully functioning WordPress job sites. The powerful front-end dashboard of the theme lets the candidates and the employers manage their profiles, job postings, job applications and other relevant actions from one place. The gorgeously designed theme also allows you to enable admin reviewing for job submissions. By using this feature, you can approve the job postings before they appear on the website. The home page could be decorated by using the job search feature or a job map. Jobmonster lets the employers accept or reject any job applications with personal messages. Visitors can view an alphabetical list of all the listed companies. Last but not the least, the theme is fully integrated with WooCommerce and Visual Composer. You can get the theme for $59. 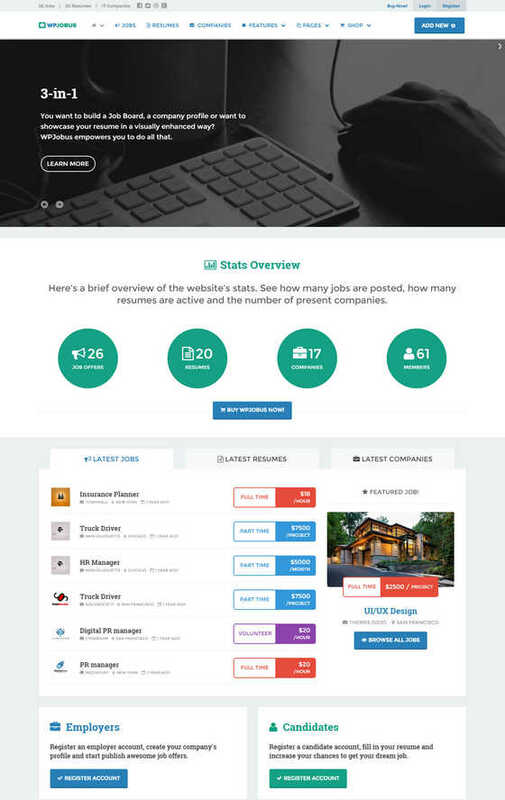 This multi-purpose WordPress theme could be used to create job directory, job listing, resume directory or job marketplace sites. Besides complete WooCommerce integration, the theme also comes with feed listing integration with SimplyHired and support for the popular slider plugins including Revolution Slider and Woo Slider. Being powered by Twitter Bootstrap framework, JobBoard works perfectly in mobile, tablet and desktop devices. Visitors can search for their desired jobs by applying various filtering options. The home page slider lets you focus on the useful features of your job site. JobBoard also allows the companies and the candidates to bookmark any resume and job posting. The front-end submission feature will allow them to control their profile in a simple and easy way. With more than 12 page templates and several custom widgets, the theme is priced at $54. If you are looking for a premium theme for creating your next freelance marketplace website, you can consider FreelanceEngine as one of the top options for building a job website using WordPress. Developed by Engine Themes, this powerful WordPress theme comes with all the necessary options for creating simple and beautiful freelance marketplace sites. 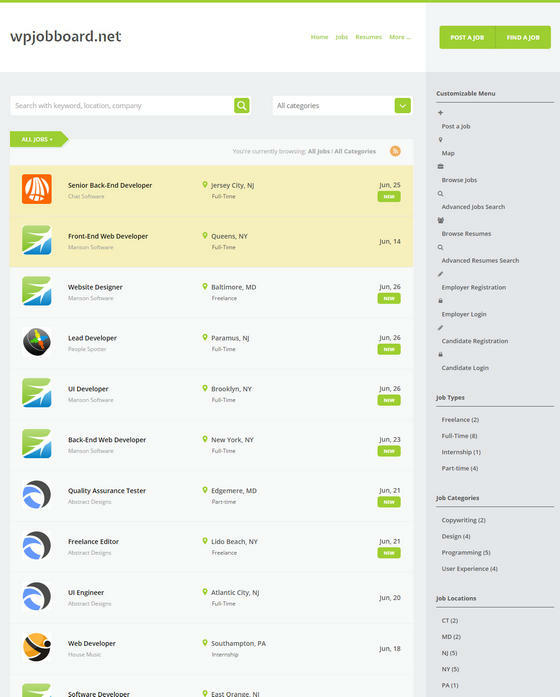 FreelanceEngine lets the users add new jobs by following four simple steps. Besides the default fields, site admins can add extra fields in all the forms. It is also possible to feature the projects with red flags. Visitors can easily search and filter through the projects. Besides the regular profile editing options, freelancers will be able to add portfolio projects too. The projects could be shared in the various social networks. For the monetization purpose, FreelanceEngine allows you to charge for posting projects, making a project featured and sell ad spaces. You can get the theme for $89. 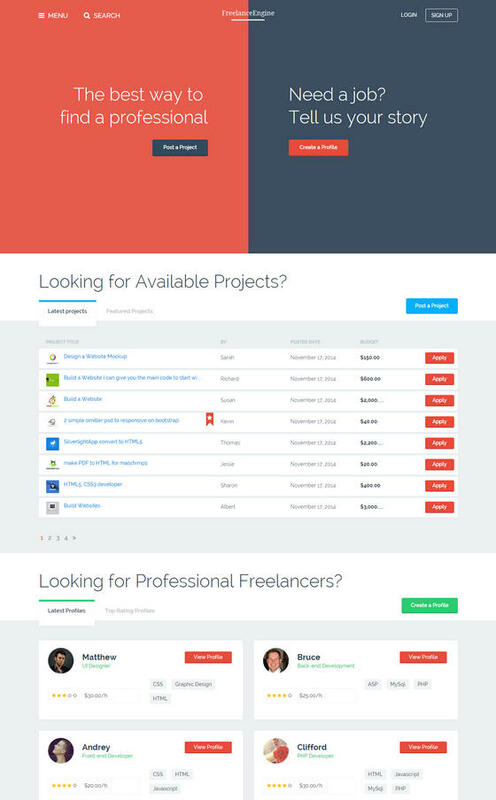 Well, those were the best premium themes that are currently available for creating professional job sites. Now, let’s see what the best plugins for creating job sites are. WP Job Manager is a simple but powerful WordPress plugin for creating a job board on any WordPress site. Provided that you can make a few CSS changes, the plugin works with any WordPress theme. It also allows you to display the job posting in various formats. The intuitive admin user interface of the plugin will be familiar for any regular WordPress user. From the admin section, you can easily edit, delete or mark any job posting as filled. You can also search and filter the job postings. 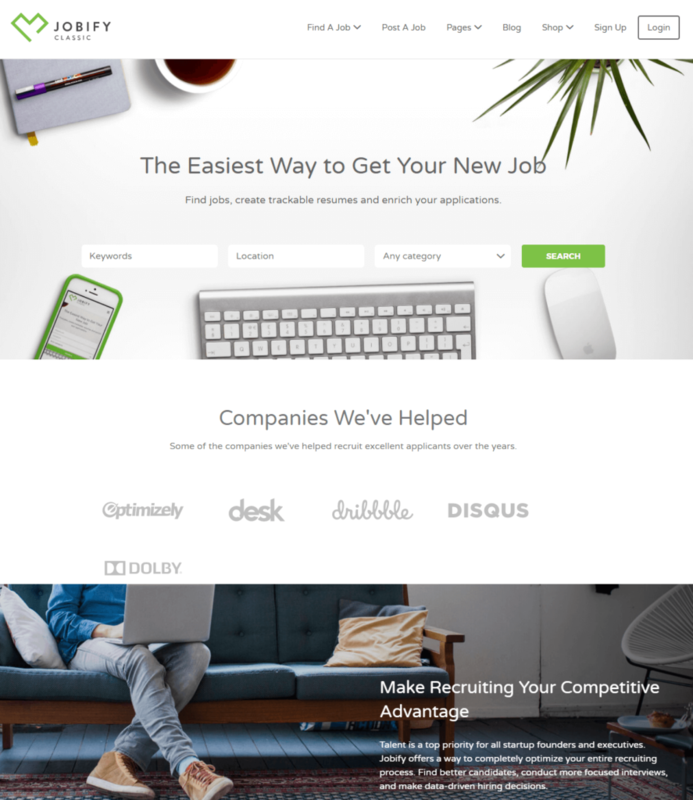 The front-end submission form will allow the recruiters to submit new jobs in a simple way. The single job view is provided with all the necessary information including the company information, job description, job type and link for applying to the job. The theme is freely available in the WordPress plugin directory. WPJobBoard is an innovative WordPress plugin for creating full-featured job sites within a short period of time. By using the plugin, you can easily integrate a job board with your existing blog or company site. 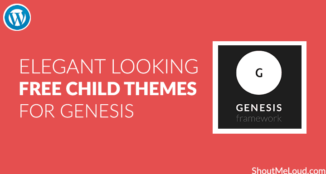 Besides working with any theme, the plugin also supports theme frameworks like Genesis, Thesis, and Headway. WPJobBoard is provided with complete integration with various payment gateways including PayPal and Stripe. As the plugin comes bundled with more than 15 shortcodes, you can easily insert simple job boards along with other advanced features. The plugin also lets you integrate your job feed with a dedicated job listing sites like SimplyHired, Indeed, and Juju. It is also possible to enable features like email notifications, job alerts etc. The premium plugin could be purchased for $97. 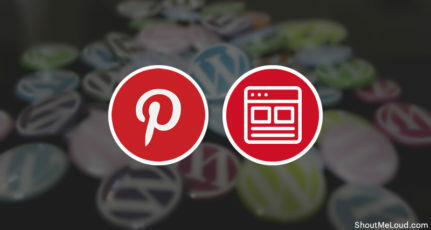 Now that you have gone through the list of 10 best WordPress themes and plugins for creating a job site, which theme(s) and/or plugin(s) you like the most? Let me know in the comments. 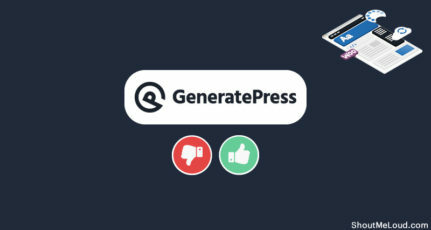 As always, if you are using any of the theme or plugin mentioned above, don’t forget to share your experience with us. Who knows, maybe a small tip from you could get the next big job site started. Don’t forget to let us know which job portal you have build by commenting below. I am making Job Portal website and em confused which theme i used now I used WPJobus theme this is best theme according to me . Currently I’m job monster one of my job niche blog. But WPjobus theme presentation is much better than jobmonster theme. Thanks for listed all of job site related themes. You have structured a complete collection of themes to perform the job of creation of a job posting portal but any ideas on how can we attract companies to post on our portal and that way we can make money. And one more thing would shared web hosting sufficient for a job portal or it depends on traffic only? I think you forgot to mention the best theme which is called JobRoller theme. I am using it on my jobportal site from last 3 years. I saw some nice job board themes from mythemeshop and frogthemes worth looking at. I will be dishonest if don’t appreciate you article because it is really helpful for a person who is initiating new sites. More so Hostgator is really good platform to launch the site because of many incentives. Thanks you for sharing valuable information. Great collection, I am looking one page wordpress theme for my profile on my site, please share some free themes with some attractive effects and color combination and please also want to ask something about SEO plugins, please tell me can I use two SEO plugins at same time. I want to use Yoast and Easy SEO plugins. List is good. Please try to include recently released themes like Jobcareer, WorkScout and othet child themes of Jobboard. Nice post! Some of the latest and popular themes are not listed in the list like JobsDirectory, Job Board, Listings and Classifieds theme of Templatic. Over all great collection. Thank you for the suggestion, Fahad. Will have a look. Really good information can be found on website . “An executive is a person who always decides sometimes he decides correctly, but he always decides.” by John H. Patterson. I must thank you Faysal for this great listing of Job board WordPress theme. I am in search of the best Job board WordPress themes list for writing on my blog. Your listing helps me a lot by giving the main idea of these themes. I must say that your listing is nicely arranged and presented with details.